"I CAN gather information about the history, mythology, genealogy, religion, culture and traditions of Hawaii through hula." "I CAN appreciate people from different cultures and understand the importance of learning to live and work together." "I CAN understand other perspectives and cultures." "I CAN recognize how the Hawaiian culture, environment and religion were affected by different voyagers, colonists, missionaries and immigrants." "I CAN make connections with the true meaning of "Aloha" as a moral code of conduct in society, my community, my school and in my home." Program Description (Arts/PE Program): During this dance workshop, students learn the origin and history of hula and its significance in Hawaiian culture. Students will learn to accurately interpret the message or meaning of the "mele" (song or poem), as intended by the composer. 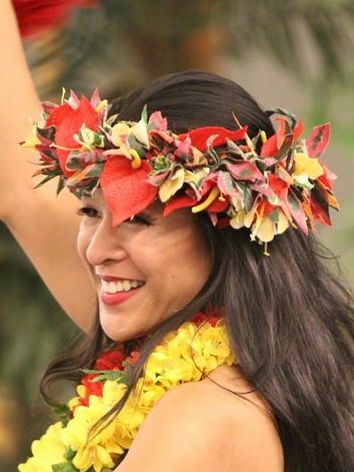 Students will learn basic hula movements and its Hawaiian dance terminology. Students will be taught the proper execution of hula movements. The "mele" and dance that will be taught is determined by the grade level (content or complexity) or by the teacher's suggestion of what may best integrate with the class curriculum objectives. Grade 6: Geography: Human Population: Human-Environment Interaction: Places, Regions, and Culture: 6–7.4 : Analyze the cultural and environmental characteristics that make places both similar to and different from one another. Grade 6: Dance: Performing: Anchor Standard 5: Develop and refine artistic techniques and work for presentation. a. Embody technical dance skills (for example, alignment, coordination, balance, core support, kinesthetic awareness, clarity of movement) to accurately execute changes of direction, levels, facings, pathways, elevations and landings, extensions of limbs, and movement transitions. Grade 7: Geography: Human Population: Human-Environment Interaction: Places, Regions, and Culture: 6–7.4 : Analyze the cultural and environmental characteristics that make places both similar to and different from one another. Grade 8: Geography: Human-Environment Interaction: Places, Regions, and Culture: 8.2: Analyze the combinations of cultural and environmental characteristics that make places both similar to and different from other places. Grade 8: Dance: Performing: Anchor Standard 5: Develop and refine artistic techniques and work for presentation. a. Embody technical dance skills (for example, functional alignment, coordination, balance, core support, clarity of movement, weight shifts, flexibility/range of motion)to replicate, recall, and execute spatial designs and musical or rhythmical dance phrases. Grade 8: Dance: Anchor Standard 7: Perceive and analyze artistic work b. Explain how the elements of dance are used in a variety of genres, styles, or cultural movement practices to communicate intent. Use genre-specific dance terminology.